One of the most novel items to debut in the computing market in the past year is the illuminated keyboard. Although there are a few brands available now, Eluminx was the first to bring this technology to market, and is the only one that I have seen offering such a variety of housing / illumination color choices. According to the manufacturer, the main benefits of a keyboard with internal luminescence include: eliminating glare from task lighting, ease eyestrain, and making the keys easy to see. All valid benefits, but in my opinion the aesthetics of their keyboards are also key... these things just look cool! 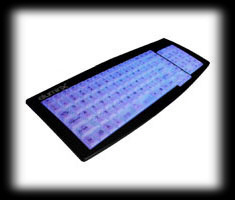 A little background information on Eluminx... A product of Auravision LLC, these keyboards use patented technology that “was first used in ruggedized laptops developed for military use, where computing efficiently at nighttime or in low-lit environments is crucial for survival... originally licensed to Itronix, the leader in ruggedized mobile computing. Itronix supplies mobile computing products to field services, telecommunications, utilities, government, aerospace, public safety, geophysical surveying, and meter reading. Itronix laptops have been field tested and approved for use by military services, as well as government agencies including the FBI and CIA.” Now the technology is available to the average user, and Eluminx offers the first models available to consumers. 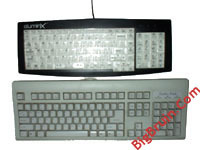 The Eluminx keyboard is sold in the box pictured on the right, which pictures the silver version of the keyboard and what appears to be the other color illumination that I am aware of... what Eluminx refers to as aquamarine. 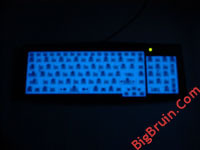 The keyboards are available in three housing colors: bone, black, and silver, and I was aware of two illumination colors: sapphire (dark blue) and aquamarine (light blue). The back of the box actually lists 6 color choices for illumination, all of which use the gem stone nomenclature, and include: sapphire, crystal (white), aquamarine, amethyst (purple), citrine (orange), and tourmaline (red). Inside the box you receive the keyboard (protected with bubble wrap), an “Instruction & Warranty Manual”, and a cut sheet with the technical specifications. The first thing I noticed about the Eluminx keyboard when I got it out of the box was that it is more compact than a standard keyboard. As pictured on the left, my old generic keyboard has a noticeably more spacious layout, with the Eluminx unit having a layout more like that of a laptop keyboard. 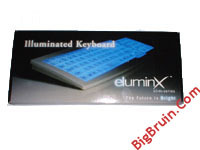 All of the necessary keys are present on the Eluminx keyboard, just that they are compressed into a smaller footprint, which may be what they are referring to by calling this the Eluminx “Slim Series”. The keys are constructed of translucent plastic, to allow the light to pass through from behind, and all of the numbering/lettering is printed in black. This color scheme creates a nice contrast with the unit unpowered, and it should look even better with the sapphire blue lighting in full effect. Another thing I noticed fairly soon after starting the review is that there are no adjustable legs on the bottom of the keyboard for adjusting the angle at which it rests on your desktop. There are two rubber grips to hold it in place, but basically you can only use it in a horizontal position. The keys themselves have a nice, crisp action to them and produce less clicking noise than other keyboards I have used. Overall it has a very solid feel, which along with its appearance tells me that this is a well designed, high quality item. After visually inspecting the keyboard I connected it to truly test it out. Having two computers in my work area, I use a Linksys KVM switch to control them, and was concerned that perhaps the Eluminx keyboard might not give off the same amount of “glow” while connected through the KVM. After using the keyboard connected directly to the pc and through the KVM, I realized there was no difference in the illumination, or any other keyboard functionality, and continued the review with the KVM in place. As pictured in the two images below, the keyboard can be seen in action. In the below left image you have the keyboard in absolute darkness and no camera flash... and in the below right image you have the keyboard well lit and using my camera’s flash. (For a dynamic demonstration of the difference, scroll to the end of the review for an animated .gif of similar images). The illumination is very pronounced when the area is very dark, but even low ambient lighting over powers the output of the keyboard, and makes it far less noticeable. I was expecting it to glow a little brighter under normal lighting conditions, but as pictured, it is dramatic in low light situations. The image on the right shows the Eluminx keyboard propped up against an Enermax CS-10181 case finished with the optional windowed side-panel and blue led case fans from Xoxide. It looks like they were made to be together, and definitely completes the look of this setup better than the $9 generic keyboard pictured earlier! Although just one example, the picture does give a good representation of how an Eluminx keyboard can really complement a modded case (although I will admit that I didn’t personally modify much of anything in this example). The Eluminx Sapphire Illuminated Keyboard is definitely well built, and should provide a stylish finishing touch to any system for years to come. 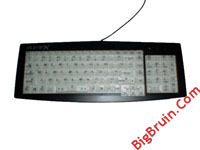 Everyday users who do a good deal of typing, and who have become accustomed to the layout of their full-sized keyboard, may not be comfortable working on the “slim” layout the Eluminx keyboard offers. It took me a couple days to get used to the layout, but I like it now and have been using it full time for at least a week (and typed this review on it, as well). Other than the compact layout not being for everyone, the only other potential issue with this keyboard would be the price. I realize that more goes into one of these than my $9 generic unit, but many people might not be ready to drop $80 and $100 (US) on a keyboard. Regardless of how cool it is, to many it is just a keyboard and nothing to get excited about or spend big bucks on. I see the Eluminx Illuminated Keyboards as being targeted more toward the modding enthusiast... Someone who may have spent alot of time and money making their system look totally unique, where a generic keyboard just wouldn’t cut it. If you’ve spent thousands of dollars on building a highly modified, high end computer system, is the price difference between your typical keyboard and the Eluminx really that big of a deal? Not really. Overall I would rate it a 8 out of 10... A very cool product, but a little pricey and not a “must have”. 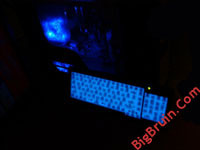 Special thanks to Eluminx for providing the Sapphire Illuminated Keyboard for review! If you’re not sure you’re ready to purchase one right now, enter to win one directly from Eluminx!! Please drop by the BigBruin.Com Forum and feel free to discuss this review. All trademarks used are properties of their respective owners. All rights reserved. Copyright © 2000 - 2004.